Arrayit offers 946 microarray printing technology with increased Pin precision, reduced weight, and proprietary extended collar design, adding up to superior performance and usability. Building on our patented design of Pins with defined uptake channels and flat tips (U.S. 6,101,946), we continue to push the envelope to provide our >5,000 installations with the most advanced and innovative contact printing technology available. Pins can be inserted and removed from the Printhead using a manual Pin tool via access holes located in the proprietary Pin collar. 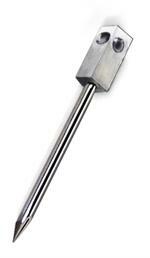 This novel design facilitates Pin handling and reduces the chances of tip contamination or damage. 946 style microarray spotting Pins and Printheads are interchangeable with our current Stealth design, allowing users to upgrade their existing systems. Use Professional style printhead for best results. 946 microarray printing technology sets the industry standard for microarray manufacturing.